Art by Jim Lavery- click to see a larger version. 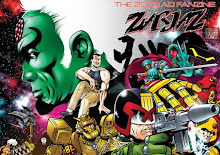 It is time for the coverstrip for Zarjaz 26 to make an appearance. 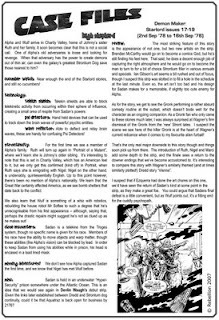 Judge Dredd- The Boys Next Door is by writer Lee Robson and artist Jim Lavery. 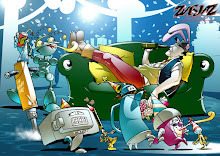 Zarjaz 26 is available now at: The FQP Webshop. 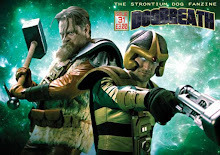 Join us tomorrow as we move back to Dogbreath 31 and don't forget, every comic purchased between now and the end of April will enter you into the raffle to win a Strontium Dog Badge courtesy of Planet Replicas.